001 - I have almost red hair, at long last! I've forever wanted red hair but being so dark it never works. I decided to bite the bullet and bleach it myself and then dye it. It's still a bit coppery/red in places but it should be all red soon! Post coming soon on how I did it, I love it. It's such a refreshing change. 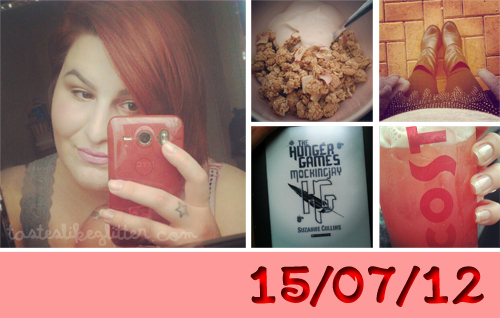 002 - Still ridiculously run down/tired at the moment so I've been living off granola and Greek honey yogurt. Such a good combination. 003 - I'm kind of bored of wearing Winter clothes in the middle of July! 004 - I'm a massive THG fan but I've put off reading the final book because I didn't want it to be over. I've been burying myself in reading lately and decided it was about time I finished up the series. What an emotional book! Catching Fire is being released in theatres on November 22, so excited! Anyone else read the books? 005 - Since I don't have a Starbucks close to me, my closest thing is a Costa or a Nero. Neither compare but I've been loving Costa Strawberry Lemonades recently.